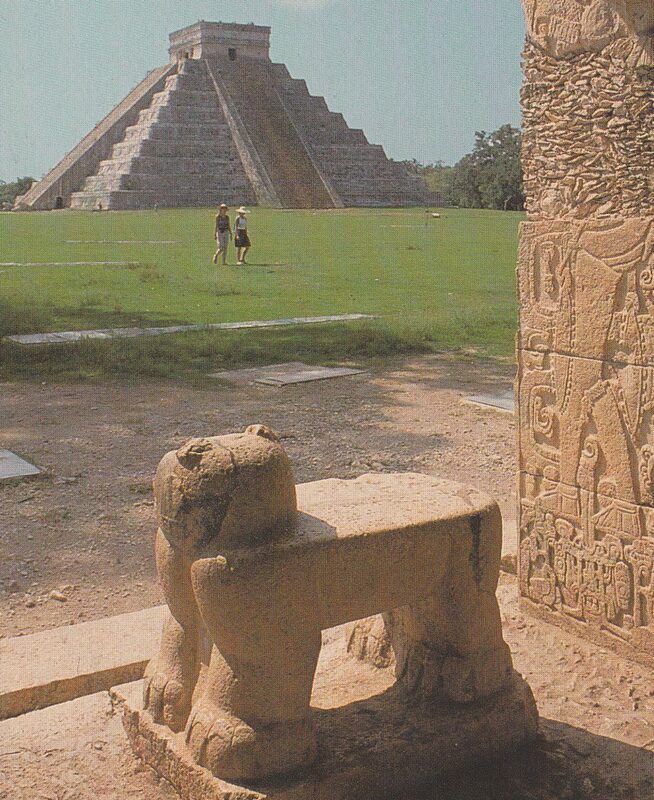 In late October of 1997 I had the pleasure to stay for a week in Mexico D.F and Merida / Yucatan. What I did not know this is the time when Mexicans prepare themselves for the Day of the Dead (Día de Muertos). Especially in Merida I was dazzled to see shops full of plastic skeletons of any kind, souvenirs, decoration and weird disguise all related to the topic of death. This reminded me all of European carnival however with a different purpose and a more strange direction. Prior to Spanish colonization in the 16th century, the celebration of death took place at the beginning of summer. And the origins of the modern Mexican holiday can be traced back to indigenous observances dating back hundreds of years and to an Aztec festival. Gradually, it was associated with October 31, November 1, and November 2 to coincide with the Western Christianity, nowadays legal holidays to remember friends and family members who have died. Today the view from the old temples and buildings at Chichen Itza just reveals a total wilderness and endless rainforest which more than thousand years ago meant the homeland for the Maya, a loose alliance of city-states in southern Mexico, Guatemala and Belize. You do not see anymore the cities, roads, reservoirs, channels or terraced fields being swallowed again by a thick jungle. Around the year 900 the Maya quickly and more mysteriously left the country and vanished most probably due to a climate change, little food and too much fighting. Estimations say that the population dropped around 90 % during this time. At a few locations, such as Chichen Itza, the Maya still lived furtheron, though they would never gain their former grandness.